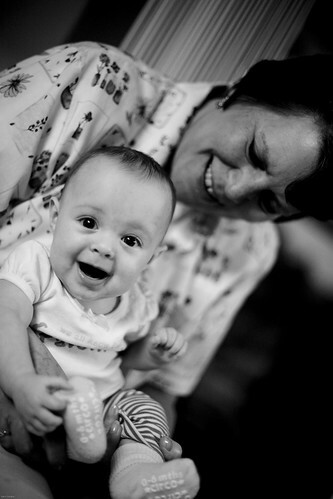 Charlie & Grandma, originally uploaded by Parris Studios:. This is Charlie cheesing it up for the camera, which I swear she's already learned to turn on the smile when she see's the ol' 5D swing her way. Look at her, so adorable, and she just gets cuter every day!! This was taken tonight while Grandma was helping Jess feed her the rice cereal. Charlie is really starting to pick up the eating thing, as soon as she sees that spoon - AHHHH and leaning forward to get it, it's awesome!! Such a cute kid - man am I blessed!! she is so cute. i wanna swing my 5d her way too!!! I love her smile, so uplifting!